On this site you can learn all the best hip exercises for men and women. This page has pictures of a hip flexor strengthening exercise that also works on balance and hip stability. The hip flexors are the muscles that bend the hip and bring your knee up towards your chest. Strong hip flexors help with running jumping and kicking and they also help to stabilize the pelvis and hip joint. Below is an exercise for the hip flexors using a cable machine, and as an added benefit the hip stabilizers on the standing leg are also strengthened at the same time. Starting Position: Begin by securing an ankle cuff around your leg and select an appropriate weight. Stand far enough away from the cable machine so that there is a little bit of tension on your muscles. Place your hands on your hips and balance on one leg. Form: Exhale and lift your knee up towards your chest. Hold for a brief second and then return to the starting position. You can also do this exercise with a straight leg. The straight leg position more closely resembles kicking; whereas, the bent knee variation more closely resembles running. Personal Trainer Tips: If you have difficulty keeping your balance, you can use a body bar or stick to assist your balance, but try to build up to balancing on your own. Focus on keeping good posture throughout. Engage your abs and core muscles and stand up tall. Move in a slow and controlled manner. If you have trouble balancing pick a spot on the floor or wall in front of you to focus on during the exercise. 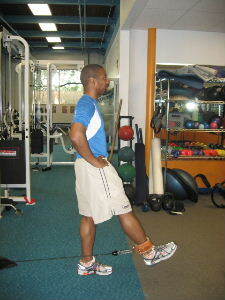 You may feel more muscle work in the stance leg and this is normal. The hip stabilizers (gluteus medius and minimus) work when you do one leg balance activities, and this is a second benefit of this exercise. On my ab exercise website I wrote an article on the role of the hip flexors in lower back pain during ab exercises. And in that article I explained that for many people aggressive strengthening of the hip flexors may irritate the lower back. Because most people have sedentary lifestyles and sit all the time, the hip flexors have a tendency to become tight and inflexible. 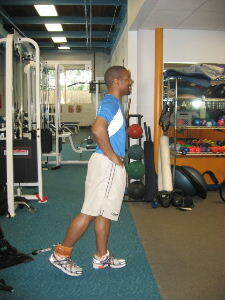 So it is important for most people to stretch the hip flexors after doing exercises for them. If you perform this exercise, make sure you stretch your hip flexors after so that you can maintain flexibility. 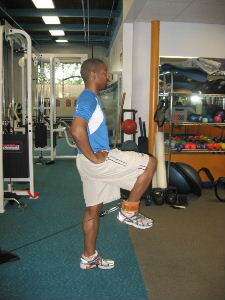 One leg cable exercises are great for improving balance and increasing hip stability. You can also do hip extension (backwards), hip abduction (out to the side), and hip adduction (inwards). If you don't have access to a cable machine, you can also do this exercise with different types of resistance bands.